Dr. Denise Staudt has been in the field of education for over 35 years. She currently serves as the Dean of the Dreeben School of Education. Prior to a career in higher education, Dr. Staudt served as a kindergarten teacher, a junior high English teacher, a high school librarian and an elementary school librarian. In addition to her degrees, she holds credentials in English as a Second Language, All Level Learning Resource Specialist, Mid-Management Administrator and Reading Specialist. Dr. Staudt is recognized at the local, state, and national levels for her work in teacher education. 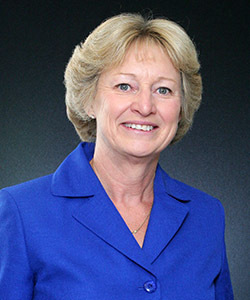 Dr. Staudt received the 2010 Ted Booker Memorial Award for professional contributions to teacher education, scholarship and policy and the 2012 Council of Deans of Education Leadership Award for recognition of outstanding leadership in the Texas Association of Colleges for Teacher Education. Dr. Staudt has served as President of many state organizations including the Texas Association of Colleges for Teacher Education, the Education Deans of Independent Universities in Texas, the Texas Association of Certification Officers, and the Texas Association of Teacher Educators. Dr. Staudt has numerous presentations and publications in the areas of teacher education, teacher training, literacy, and technology. Providing professional development for both domestic and international teachers to improve the quality of teaching in today’s classrooms.